Pets continue to die after eating jerky treats according to a new report published this week by the FDA. At least 360 dogs have died of 2,200 that have fallen ill after consuming these products. 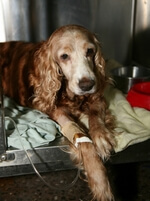 Although the majority of complaints involve dogs, cats have also been affected. The bulk of the issues are associated with chicken jerky treats, tenders and strips. Yet other products include “duck, sweet potato and treats where chicken or duck jerky is wrapped around dried fruits, sweet potatoes, or yams”. Fanconi syndrome is a disorder of the kidneys in which certain substances normally absorbed into the bloodstream are released into the urine instead. 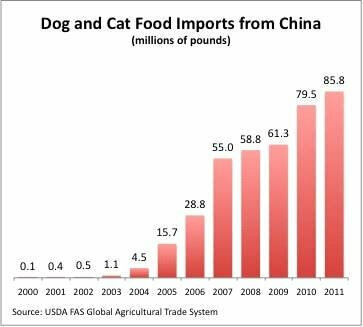 In the past ten years, there has been a dramatic increase in the import of pet food from China into the United States. That’s because human consumption of poultry in China consists mostly of dark meat. And this leaves a massive amount of light meat poultry products available for export. From 2003, when China first approached the USDA about poultry exports, to 2011, the volume of pet food exports to the United States from China has grown 85-fold. It’s estimated that nearly 86 million pounds of pet food came from China in 2011 alone. What’s more, pet treats, including jerky, are now the fastest growing segment of the pet food market. After inspecting five Chinese manufacturing plants chosen for their significant amount of jerky product exported to the US, the FDA identified one firm that had falsified documents regarding their use of glycerin. Glycerin is an ingredient found in most jerky pet treats and also implicated as a possible cause of the problem. The FDA has announced it will begin testing the affected products to determine if irradiation may have contributed to some of the treat related issues. That’s because companies like Nestle Purina PetCare have confirmed they are using irradiation to sterilize the affected treats. In a related story published in 2009, the Australian government is reported to have banned the use of this process following reports of paralysis and death in cats after consuming irradiated cat food. Jerky treats are not a necessary part of a balanced canine diet. So, why keep feeding these risky products to your dog? Since the FDA cannot legally order a recall based upon complaints alone, we believe the pet food industry should act responsibly on its own and voluntarily stop selling these controversial treats. If you agree with us that these Chinese-made jerky treats should be immediately recalled, please help us send this urgent message to the pet food industry — and sign this petition now.